Flashback to 1982 – there was a lingering recession that had engulfed the U.S. economy and cars were shrinking faster than the money in most people’s wallets. If horsepower had taken a fall in the 1970s, by 1982 it was taken down to a still lower notch. The norm by 1982 was 120 – 140 horsepower V8s. With this in mind it seems a great paradox that 1982 would also be a time when the seeds were beginning to be sown for a new horsepower war. Ford had literally destroyed the Mustang in the 1970s, the same way it destroyed the Thunderbird in the late 1960s. Ford sacrificed their popular 2+2 "pony car" for the sake of sales with the introduction of the 1974 Mustang II. Sales initially were good but the Pinto based Mustang II just never lived up to the Mustang name. Ford realized its blunder and released an all-new stylish "Fox-bodied" Mustang for 1979. Though this was a step in the right direction the hottest available motor under the hood was a 139 horsepower 2bbl 302 CID V8 that paled in comparison to GM’s best for 1979: the Chevrolet Corvette (225 horsepower) and Pontiac Trans Am (220 horsepower). Things got worse for the Mustang in 1980 and 1981 when the only V8 offered was a 2bbl 4.2 liter (255 CID – a smaller bore version of the 302 V8), rated at a dismal 120 horsepower. This all changed in 1982, Ford finally decided to get serious and return the Mustang to its performance roots by offering the Mustang GT. The new for 1982 Mustang GT had the Mustang’s first high performance V8 option in almost 10 years – a 2bbl (5.0 liter) 302 HO (High-Output) V8 rated at 157 horsepower and 240 lbs/ft of torque. The GT nameplate was no stranger to the Mustang lineup, it was an optional performance/decor package for the 1965 – 1969 Mustang. The timing of the GT’s return could not have been better since power for the newly redesigned Camaro Z28 and Pontiac Trans Am (GM’s performance f-bodies) had been detuned for 1982 when compared to previous years. It was not that Chevrolet and Pontiac had a choice in the detuned motors. Large displacement motors were long gone, and 1982 was the first year for the corporate GM engines. Translated this meant no more Pontiac V8 engines, Pontiac was forced to use a Chevrolet small block 5.0 liter (305 CID) V8 to power its Trans Am. The Z28 and Trans Am had two 5.0 liter V8 engine options: the base LG4 rated at 145 horsepower and the high performance LU5 Cross-Fire Injection (dual TBI fuel injection) with a hot camshaft and a high 9.5:1 compression ratio good for 165 horsepower. On paper it would seem that the Cross-Fire Injection 1982 Camaro Z28 and Trans Am would be slightly faster with an 8 horsepower advantage. However that was not the case, the Mustang GT was faster. The GT was a little lighter than the GM f-bodies and its hot motor, the 302 HO, came only with a 4-speed manual transmission whereas the LU5 Cross-Fire motor could only be had with a 3-speed automatic transmission (only the base LG4 could be ordered with a 4-speed manual transmission on the Z28 and Trans Am). In the August 1982 issue of Car and Driver magazine there was a 4-way test between the 1982 Mustang GT, 1982 Camaro Z28 (LU5), 1982 Trans Am (LG4 / 4-speed), and 1982 Porsche 928. The Porsche 928 was the clear acceleration winner since it packed a 220 horsepower 4.5 liter V8 under its hood. However the surprise of the test was the Mustang GT, which came in second in the acceleration tests with a 1/4 mile time of 16.2 seconds at 86 mph and a 0-60 mph time of 8.1 seconds. The LU5 Camaro Z28 was a very close third with a 1/4 mile time of 16.4 seconds at 83 mph and an 8.6 seconds 0-60 mph time. For the first time in a long time the Mustang was back on top when it came to American muscle. It may have been the slimmest of victories, but the guys in Dearborn had shown the world the Mustang was back. Where the Mustang GT lagged behind its competition in the Car and Driver magazine test was in the handling department, its skidpad number was a mediocre 0.75 when compared to the Z28 (0.81), Trans Am (0.81), and 928 (0.81). 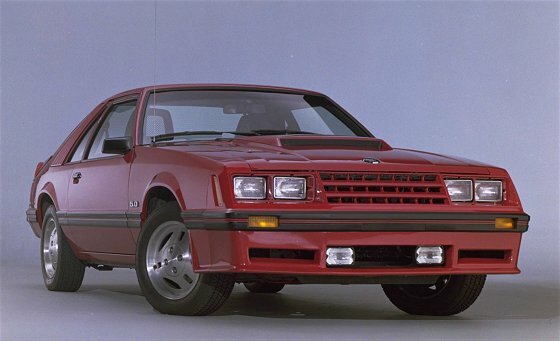 As good as performance was for the 1982 Mustang GT, there was a downside. If a buyer wanted an automatic transmission with a Mustang GT, Ford did provide – but the buyer was stuck with only a 120 horsepower 4.2 liter V8. Fortunately most buyers passed over the automatic option, so very few 4.2 liter V8 powered GTs were produced for 1982. Things got mighty bizarre for Canadian buyers, for some strange reason Ford decided to offer every available 1982 Mustang engine on the Canadian Mustang GT. This included the 5.0 liter HO V8, 4.2 liter V8, 3.3 liter V6, turbo 2.3 liter 4 cylinder (a Canadian only option for 1982), and the base 2.3 liter 4 cylinder. The Mustang GT’s 2bbl 302 HO V8 was much improved over the 132 horsepower 2bbl 302 available in other 1982 Ford cars and trucks. The 25 horsepower increase was mainly due to a hot camshaft and a free-flow aluminum intake manifold. Also helping was a new dual snorkel air-cleaner (taken from the 1982 LTD 351 CID Windsor V8 powered police interceptor), double-row roller timing chain, increased valve spring pressures, and a few other performance tweaks. The final result was an advertised 8.4:1 compression ratio. 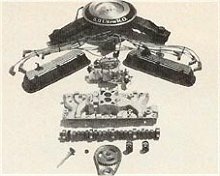 The beauty of the new 302 HO was that it was an honest to goodness high-revving motor unlike the standard low compression 302. With the 302 HO, no longer would the 302, run out of steam by 4,000 rpm, it now went all the way up to 5,000 rpm without feeling winded. This accomplishment was even more remarkable considering the HO motor still only had a Motorcraft 2bbl carburetor. The Borg-Warner SROD (Single Rail Over Drive) 4-speed transmission did a good job of getting most of the HO’s horsepower to the rear axle. It even contained an overdrive (4th) gear that provided for better fuel efficiency at highway speeds. This transmission worked well but its production life was very short since Borg-Warner released a new 5-speed manual (5th gear was the overdrive gear) for 1983 called the T5. The T5 made it to the Mustang GT order sheet in the middle of the 1983 production year. And getting the power of the 1982 Mustang GT’s 302 HO to the ground was a solid rear axle with a performance oriented 3.08 ratio. Not to be forgotten, the GT had a growl not heard on a Mustang since 1973, a free-flow dual outlet exhaust system (exiting out the rear of the car on the drivers side), provided a nice deep V8 rumble letting all observers know there was something special under the hood. The "5.0" badges on the GT’s front quarter panels behind the front wheel wells was also a subtitle hint. The Mustang GT was a well-balanced car that provided great acceleration, good handling, good braking, and good steering feel. 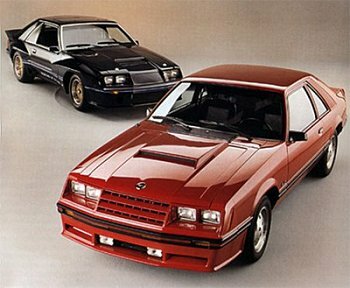 As mentioned earlier the GT beat in acceleration the newly redesigned 1982 Camaro Z28 and Trans Am, however the Mustang fell behinds its two rivals when it came to handling and braking. The GT’s rear drum brakes, skinny tires, and softer suspension were no match for its rivals’ fatter tires, 4-wheel disc brakes, and well-tuned suspensions. The Mustang had one advantage over the Z28 and Trans Am, it was almost 400 lbs lighter which made it feel very nimble. With all this considered the Mustang was still one of the best handling and braking cars available in America for 1982. It used state-of-the-art 190/65HR390 Michelin TRX tires mounted on special TRX wheels. Ford specially tuned the suspension for optimum handling with these tires. The 1982 Mustang GT had the styling to go with its newfound performance, it came standard with a front spoiler with integrated fog lights, rear deck lid spoiler, and a sporty non-functioning hood scoop. These items with the exception of the hood scoop were first introduced on the 1979 Indy Pace Car Edition Mustang. The Pace Car styling carried over to the 1980 – 1981 Mustang Cobra, which had the same hood scoop as the 1982 GT. So it came as no surprise the Mustang GT had replaced the Cobra for 1982. The GT was only available in one body style – a 2-door with an opening rear fastback hatch. The GT did not have any gaudy decals or chrome and had only a small amount of blacked-out exterior trim. Upon the GT’s release for 1982, there were only three exterior colors available – medium red, black, and silver. Towards the end of the 1982 model year a bright red exterior color became available on the GT. The interior of the Mustang GT was very modern unlike the other 1982 Mustang models, which still had the 1970s fake wood grain, chrome, and bright colors. The GT’s interior was blacked out – the dash along with every button and knob were a very stylish flat black. Even the sporty leather wrapped 4-spoke steering wheel was flat black. The overall look was clean and attractive. Optional Recaro seats, provided good comfort and lumbar support and added to the appeal of the GT’s interior. And for those who wanted a little wind in the face motoring – T-tops and a removable sunroof were both available options. Those who liked the 1982 Mustang GT platform but wanted a little variety, they were in luck since the 302 HO V8 was also available on the 1982 Mercury Capri RS with all the GT’s performance items. The Capri RS when compared to the Mustang had more conservative lines and an opening bubble window rear hatch. Also interesting to note, Ford in 1982 made a special deal with the California Highway Patrol (which had a history of buying the fastest police interceptor cars it could get its hands on) to provide them a stripped down 302 HO Mustang coupe police interceptor package. The coupe weighed less than the hatchback body style the GT used, so it was a unfortunate that the coupe body style with the 302 HO was not available to the general public. Ford quickly realized their mistake, and within a few model years there was a base Mustang coupe available to the general public with all the GT’s performance goodies and a 302 HO V8 – it was called the Mustang LX 5.0. Ford with the 1982 Mustang GT offered its first legitimate high performance Mustang in almost 10 years. 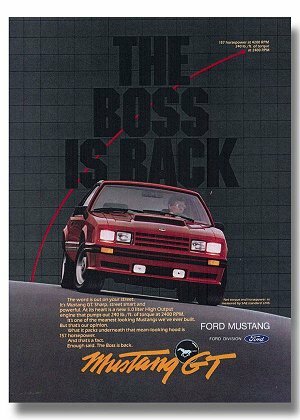 Ford’s advertising campaign that year stated in bold letters – "The Boss is Back". Not only did the boss return in 1982, it has flourished to this day. The 302 HO or 5.0 Mustang GT as it later became known, continued to increase in horsepower and torque as the 1980s progressed. Handling also improved during this time. The end result was the 1982 Mustang GT began the rebuilding of the Mustang’s high performance reputation, which had been lost in the 1970s. Today it’s a given the Mustang is a legitimate high performance car, there’s still a Mustang GT and it produces around 300 horsepower and is more popular than ever. And there’s even a 500 horsepower 2008 Shelby Mustang GT500 that can be ordered or purchased at your local Ford dealership. Who would have ever thought that possible 26 years ago? The Mustang still lives on stronger than ever while the competition is long gone – there’s no new Z28 or Trans Am available to the buying public (both departed at the end of the 2002 model year). In the final analysis, there is not a doubt that the 1982 Mustang GT – saved the Mustang, one of the greatest icons in automotive history. The Mustang is America’s "pony car" and it would not be here today if it had not been for the 1982 Mustang GT.